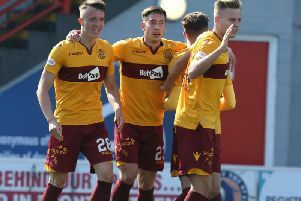 Rated as 22/1 no hopers to win with one bookie, Motherwell produced a sensational second half to beat champions Celtic in their own back yard. Mark McGhee’s men could easily have scored five in the second half, making a mockery of the pre-match odds and moving them onto 21 points, just two points off the Scottish Premiership top six. The freakishly mild weather should have told us we were in for a shock, as ’Well got their first Parkhead win since a Simon Lappin goal gave them a 1-0 triumph in April 2008 during McGhee’s first spell as ’Well boss. Celtic’s Darren McGregor shot over in the fifth minute on Saturday, before the hosts had a ‘goal’ correctly disallowed for offside on 19 minutes when Nadir Ciftci shot in after Nir Bitton’s initial effort had been parried by Connor Ripley. Celtic failed to hit the target with four late first half chances, with Kris Commons, Ciftci, James Forrest and Jozo Simunovic the guilty men. Celtic almost went ahead after a 47th minute Commons corner, which saw Dedryck Boyata’s header cleared off the line by Keith Lasley. Motherwell then wasted a glorious chance to go ahead when Lionel Ainsworth – on as a half-time sub for Liam Grimshaw – ran through on Craig Gordon after making an interception but fluffed his chip shot over the bar. ’Well paid for that miss on 48 minutes when Bitton’s shot was deflected off Stevie Hammell into the net to put Celtic 1-0 up. But the game was turning into a thriller and Motherwell were level just two minutes later when superb wing play by Marvin Johnson on the left set up Moult for an easy tap in. Ciftci and ’Well’s Stephen Pearson squared up after a foul on Scott McDonald, before ’Well sensationally went ahead on 58 minutes. Moult scored from a penalty awarded for Simunovic’s foul on McDonald. And it should have got even better for the visitors on 64 minutes. Boyata – who had a torrid afternoon – was beaten all ends up by McDonald and his cross from the right was blasted over by Moult from 10 yards. Bitton had a volley blocked on the line following a 71st minute corner, before ’Well defender Stephen McManus went off with concussion after an aerial collision. Commons had a shot saved before ’Well raced to the other end and Johnson’s shot was stopped after an Ainsworth pass. Sub Ainsworth was himself substituted for defender Luke Watt, as Motherwell saw out the last 10 minutes for a famous win. celtic: Gordon, Simunovic, Bitton, Ciftci, Commons, Rogic (Cole 73), Boyata, Lustig, McGregor, Forrest (Allan 66), Tierney, Greenway. motherwell: Ripley, Hammell, Grimshaw (Ainsworth 45), (Watt 80), McManus (Laing 76), Pearson, Johnson, Lasley, Law, Moult, Hall, McDonald.